Sleek lines. Stylish curves. Two times the suction power compared to the competition. 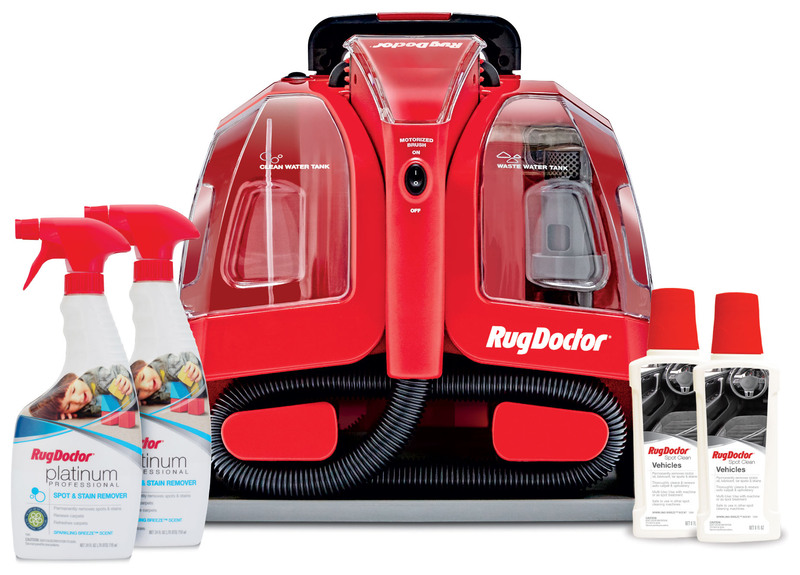 With a powerful handheld motorized brush, retractable handle and carpet-friendly wheels, the Rug Doctor Portable Spot Cleaner is engineered to handle the toughest stains life throws your way, no matter where they happen. PLUS, with the NEW Auto Care Pack, you get all of the additional tools you need to get and keep that car clean and fresh. Automobile interiors. Pet accidents. Area rugs. Sofas. Chairs. No matter where the stain and no matter what the source, there’s a Rug Doctor solution that can handle it. The retractable handle and carpet-friendly wheels make the Portable Spot Cleaner easy to use in tight spaces. The Portable Spot Cleaner’s brush moves 1200 times per minute, scrubbing the fibers deep in the carpet to break up even set-in stains. We’ve engineered our machine to have two times the suction power compared to other portable cleaners, so you get the best possible clean. Whether you’ve got kids prone to spills or you just like to keep your car spotless, the Portable Spot Cleaner can keep your ride fresh all year long. The Portable Spot Cleaner is ideal for cleaning up spots, spills and stains on hard-to-reach soft surfaces all over your home. The Portable Spot Cleaner is ideal for cleaning any soft surface in your home, including rugs, couches, mattresses, pet beds, car seats and more. © 2019 RUG DOCTOR, LLC. ALL RIGHTS RESERVED.